Oftentimes you’ll hear neighbors referring to Sun City, AZ as the ‘Original Fun City’ and it really is a wonderfully fun place filled with scenic beauty, excellent golf courses, and a thriving active retired community. In fact, it was the first well known active retirement community in the country. Lots of press and wonderful neighbors have voted it one of the top places to be in Arizona! This makes it a perfect RV vacation spot or permanent home for anyone that wants to trade in the Northern cold for the Arizona sun. Sun City and the surrounding areas of Phoenix and Glendale offer amazing museums, the famous botanical garden, excellent restaurants, art exhibits and so much more. RV travelers in particular are drawn to Sun City due to all the fun and sun it offers. What isn’t so fun though is a breakdown in the function of your trusty RV and mobile home. When bad luck strikes and you’re in need of RV repair Sun City AZ, whether it be for your in-RV fridge, stove, air conditioner or engine, remember to go to Fix My RV! The expert staff can repair or replace whatever you may need in order to have a fully functional home-on-the-go. Don’t get caught in the Arizona heat with a broken air conditioner in your RV, just get yourself to Fix My RV. The last thing anyone on an RV adventure wants to do is sit around comparing prices of services or waiting days for repairs like with the other guys. 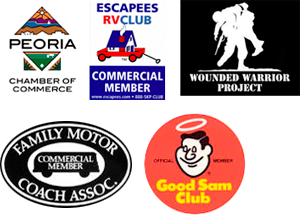 Fix My RV is the only place you need to go for fast, friendly RV repair Sun City AZ. They’ll make you a priority and get you up, running and on the road to your next fun experience in Arizona! Call, visit their website or stop by to learn more about everything they have to offer.